of the theatre. Can I bring them inside? not allowed inside our theatres. are being disruptive during a movie? I have lost a personal item at Malco Theatres. theatre in which you misplaced your item. www.malco.com to choose a location. and I havent received anything..Can I check on it..
once I purchased my movie tickets online? from addresses it does not recognize. from age 2 through 11 years old. added to the 3D ticket price. 18 in Jonesboro, AR and 17 in other areas. accompanies the underage child to the movie. will be admitted to any R-rated film after 6:00pm. of age is admitted to the theatre after 8:00pm. website show the current status of ticket sales. no longer available for purchase or is sold out. theatre's page for its payment details. show or showtime,click the "Times/Locations/Tickets"
No, Special Events carry a pass restriction. specific theatre of your choice for additional details. At this time, tickets for Malco Theatres are available exclusively though www.malco.com. are listed under the "More Information…" tab. times are found only at www.malco.com. times as a courtesy only. go on sale the Wednesday before release. on sale further in advance for select movies. and times are subject to change. that are available to us. price and an evening ticket price? Does Malco Theatres offer Twilight Shows? locations only from 4:00pm to 6:00pm. Does Malco Theatres offer Midnight Shows? the Summer Drive-In begin at dusk. at a Malco Theatres location? for more information on church rentals. for complete Birthday Party information. it available on our website very soon. please email us at comment1@malco.com. Combos are available at all locations! are also available for bulk purchase. Grandview Cinema - Madison, MS.
How much cholesterol is in your popcorn oil? cholesterol is found only in animal fats. in the refining process. Oil is gluten free. one transaction at the theatre. Can I purchase concession items with a Malco Theatres Gift Card? menu with the Malco Theatres Gift Card. another Malco Theatres Gift Card? used to purchase additional Malco Gift Cards. it may be used by anyone. amount starting with a $10 minimum. All credit cards must have a U.S. billing address. of payment for Malco Theatres Gift Cards? MasterCard, American Express, and Discover. about my Malco Theatres Gift Card? 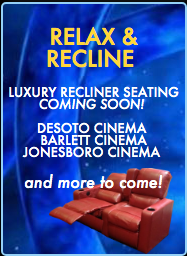 or visit any Malco Theatres location. I'd like to call Malco Theatres. What is the phone number? information for your local Malco Theatres location. I'd like to write Malco Theatres a letter. under the About Malco tab. Does Malco Theatres offer Open Caption (OC) Films? Yes, many theatres offer Open Caption films. Please visit the "Coming Soon"
Please visit the "Now Playing" section of our website. Big Screen at the Paradiso? number is included on the ticket information. The big screen at Paradiso is Auditorium #1.
please call the theatre at 901-682-1754.
can be found at www.mpaa.org. and 17 in other areas. years of age is admitted to the theatre after 8:00pm. at the movies can help grow your business! Contact them today at 1-800-724-MOVIE. letterhead at least 3 weeks prior to the event date. can benefit from buying bulk admission tickets. at all Malco Theatres locations and never expire! be subject to Film Studio restrictions. subject to Film Studio restrictions. Recycling Bins for plastic bottles. theatre light bulbs to LED. contact you should additional information be necessary. dial-up, or a mobile browser, try Malco2Go for a simpler page.